Extreme Flash Floods Hit Hawaii As Dangerous Hurricane Lane Could Dump "30-40 Inches Of Rain"
Dangerous Hurricane Lane is moving toward the main Hawaiian islands as a powerful Category 3 storm Friday. The hurricane could hit the isolated volcanic archipelago in the Central Pacific within 24 hours, and unleash torrential rain that may produce destructive flash floods and landslides over much of the island chain, along with coastal flooding, and high winds through Saturday. This threat of extreme flooding could occur across most of the island chain was summed up succinctly by The Weather Channel hurricane expert Dr. Rick Knabb in a tweet late Thursday night. 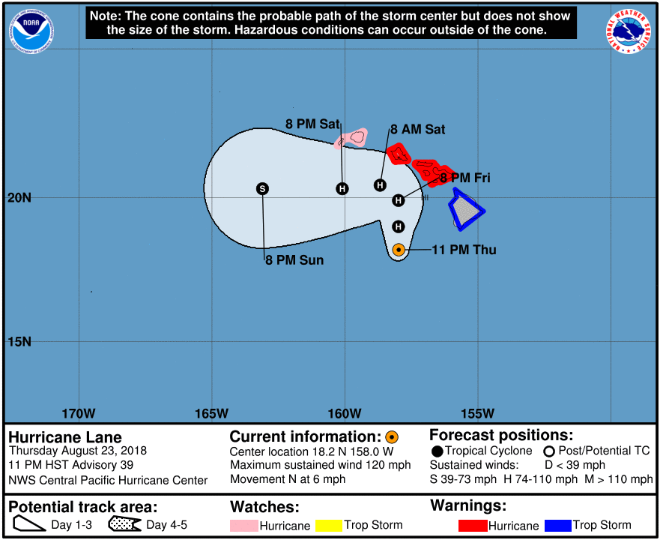 Meteorologists said Lane’s eye passed over a weather buoy about 250 miles southwest of the Big Island on Thursday morning and recorded winds that sustained +100 miles per hour. “The center of Hurricane Lane was located near latitude 18.2 North, longitude 158.0 West. Lane is moving toward the north near 6 mph (9 km/h), and this general motion is expected to continue through Friday. A turn toward the west is anticipated Saturday, with an increase in forward speed. On the latest forecast track, the center of Lane will move over, or dangerously close to portions of the main Hawaiian islands late Friday and Friday night. Maximum sustained winds are near 120 mph (195 km/h) with higher gusts. Lane remains a powerful category 3 hurricane on the Saffir-Simpson Hurricane Wind Scale. Some weakening is forecast from Friday through late Saturday, but Lane is expected to remain a hurricane as it approaches the islands. Hurricane-force winds extend outward up to 35 miles (55 km) from the center and tropical-storm-force winds extend outward up to 125 miles (205 km). The estimated minimum central pressure is 956 mb (28.23 inches),” said the CPHC. Extreme Meteorologist @accuweather, Reed Timmer, records flash flooding conditions in Hilo, Hawaii, above Rainbow Falls with already 20 inches of rainfall. “SIGNIFICANT flood with flash flooding meeting the tide in Bay Front, Hilo, HI,” said Reed Timmer. ABC News launched a drone on Friday morning to observe flooding conditions on Hawaii’s Big Island. NBC compiles a montage of footage showing the severe flooding before Hurricane Lane arrives. 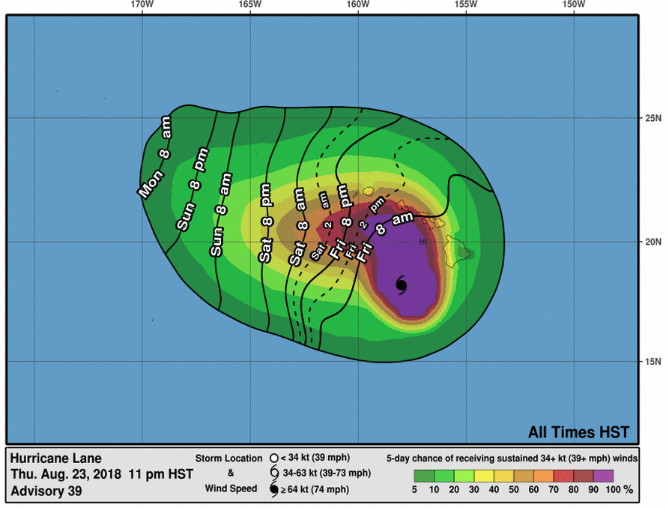 According to the center, as of late Thursday night local time, Lane was roughly 200 miles south of Honolulu and 165 miles southwest of Kailua-Kona, traveling north at 6 miles per hour with sustained winds roughly around 120 miles per hour. According to the latest spaghetti model for Hurricane Lane, “GFS, HMON, and HWRF Hurricane models show a more north movement into Maui (which puts the western side of the Big Island on the ‘dirty’ side),” said Mikes Weather Page. The website said the EURO model is staying offshore, however, all eyes on Maui as it appears many models show a direct impact.